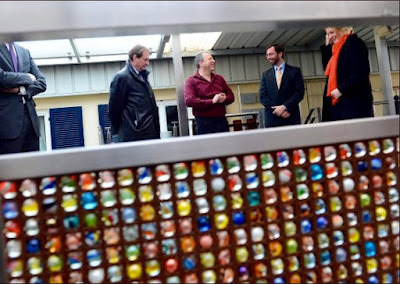 Today, Hereditary Grand Duke Guillaume was in Grevenmacher to visit Ateliers Origer, as part of the series of visits he makes each year in coordination with the Chambre des Métiers. Ateliers Origer is a specialty craftsmanship company focused on mechanical engineering, metal and locksmith construction, and LPG conversion. The company, headed by Yves Origer, was founded in 1988. The Hereditary Grand Duke's visit included a presentation about Ateliers Origer's history and current activities, as well as a visit to the workshops. A little more information, as well as more photos, at Tageblatt.